Want to see something truly special during your time in Florence, that you will never get the chance to see again? Then head to the church of Santa Croce! The main altar has been under restoration by the Opificio delle Pietre Dure with scaffolding all the way up for a few years now. While the scaffolding hinders your vision of the beautiful frescoes of the Middle Ages painted by Agnolo Gaddi of the “Legend of the True Cross” from below, works are practically complete and will come down in a few months – this is your last chance to see them up close! 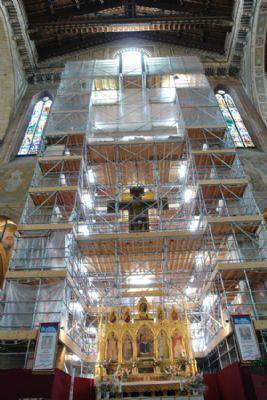 The church offers guided tours up the scaffolding with a chance to learn about the stories in the chapel from feet away. The view cannot be beat, you won’t get the chance ever again in this lifetime to see them this up close: the frescoes go as high as 7 floors, the view from below is completely different – when are you ever going to be able to admire them from this distance? The chapel is dedicated to the legend of the Holy Cross and was under the patronage of the Alberti family (aside from the altar, sponsored by the Alamanni family). 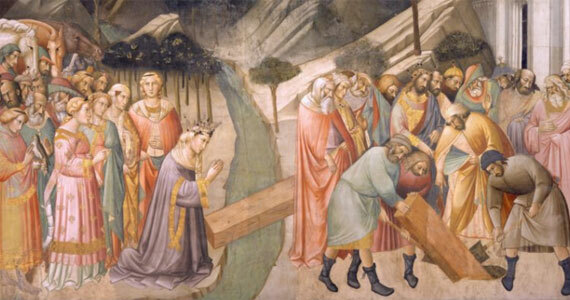 Around 1380, Agnolo Gaddi – son of the more famous Taddeo and the last of the followers of Giotto’s school – frescoed the walls with “The Legend of the True Cross“, based on the book entitled “Golden Legend” written by a Franciscan monk Jacopo da Varagine. The guided tour is offered daily from Monday through Saturday at 11am and 3pm and on Sunday at 3pm in either English or Italian. The cost is €10 and includes the ticket to visit the entire rest of Santa Croce (church, Pazzi chapel, museum). Since the normal ticket for the church and museum costs €6, the tour is actually a steal! Bookings are required by email at booking@santacroceopera.it. The tour lasts about 60 minutes. The climb up the scaffolding is 90 steps, about 7 floors, with stops along the way as the guide explains the stories and techniques used to create the frescoes and in the restoration process. After your tour, admire the remaining works in Santa Croce: tombs and memorials to some of the most famous Italians, including Michelangelo, Galileo, Niccolò Machiavelli and Dante Alighieri, a beautiful restored crucifix by Cimabue (damaged by the 1966 flood in Florence) in the museum and frescoes by Giotto in the Bardi and Peruzzi Chapels and by Taddeo Gaddi (the father of Agnolo, frescoes in the church and his Last Supper in the refectory), Renaissance works in the Pazzi chapel by Brunelleschi, a crucifix by Donatello and much more. 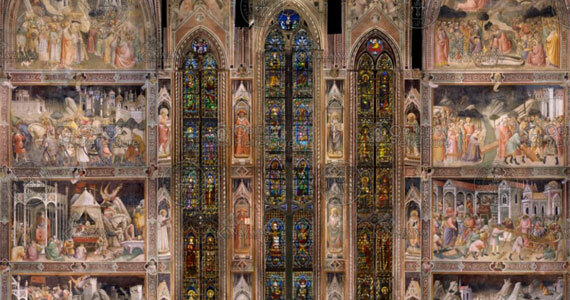 A visit to the Franciscan Basilica of Santa Croce during your visit to Florence is a must, don’t miss out! UPDATE 06/20/2013: We just returned from a guided visit to the main chapel in Santa Croce this morning and can confirm it is an absolute must while you’re in Florence! The restoration process is complete but scaffolding will remain up for the summer to give everyone a chance to admire the frescoes from up close before the project will close on November 12. Not only are the frescoes breathtaking, with the colors so bright they seem painted just a few years ago but our tour guide also taught us about the stories themselves and the thinking behind 13th century storytelling that influenced how the stories were told. At this distance, you can admire the faces, clothes and details in a way you can only do from books.